To enable inbound DKIM verification, select Inbound Protection, select Domain-based Authentication and select DomainKeys Identified Mail (DKIM) Verification. If you haven’t configured and inbound DKIM you’ll see only the Default domain settings, which is a disabled setting. The last step is to enable DMARC verification. Again select Inbound Protection, select Domain-based Authentication and select Domain-based Message Authentication, Reporting and Conformance (DMARC). In Reject option, you can select Delete entire message (default), but also select Do Not Intercept or Quarantine, in case you don’t feel comfortable deleting inbound messages. 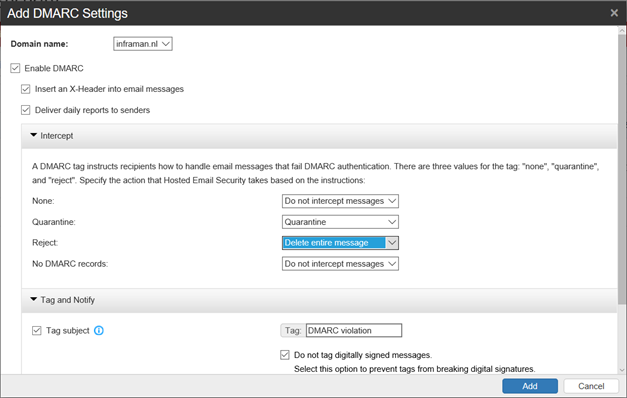 Click Add to store the DMARC verification to the HES configuration. To test the inbound setting I can send an email from my Gmail account to my inframan.nl account. When checking the header of the message I can see the DKIM signature that Gmail adds, I can see the Received SPF header and I can see the Authentication results. As you can see everything is verified successfully. 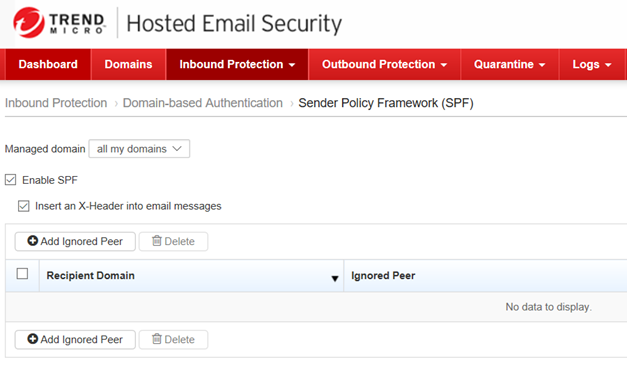 In last three blogposts I’ve been discussing Hosted Email Security from TrendMicro. 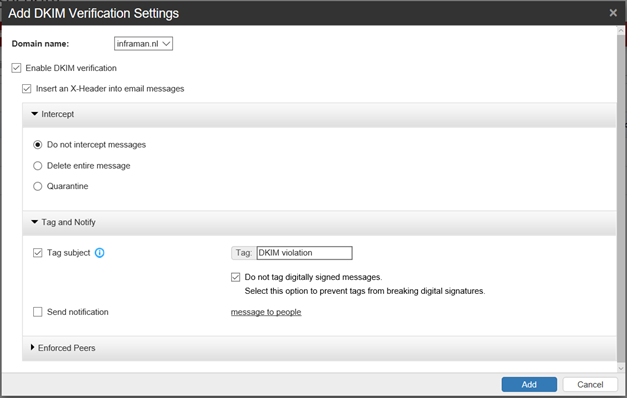 In the first two blogpost I showed you how to enable SPF, DKIM signing and DMARC verification for outbound email (i.e. stuff that’s performed by email servers of the recipients) and in this last blogpost I’ve shown you how to enable SPF, DKIM and DMARC verification, i.e. the services you have to enable when receiving email messages. Especially for inbound messages using an online service is very convenient since it will remove the complexity and the hassle of maintaining the configuration.